From the Garden of Eden to the Mount of Olives, it was through words that God spoke to men. 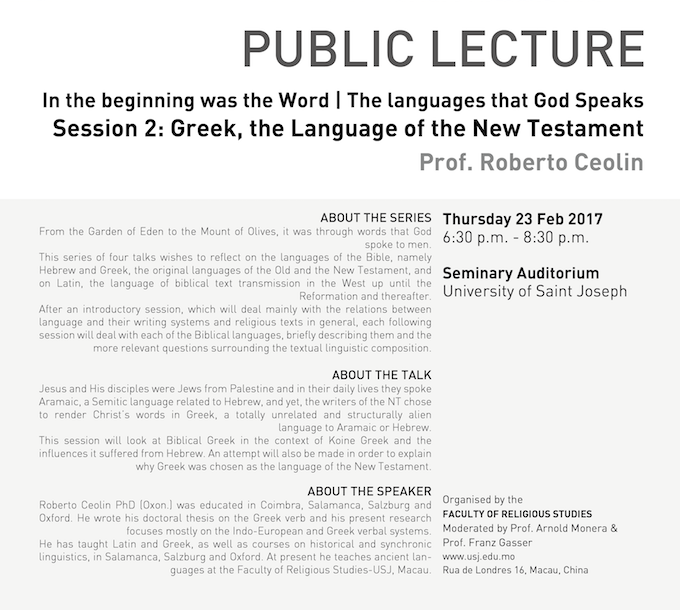 This series of four talks wishes to reflect on the languages of the Bible, namely Hebrew and Greek, the original languages of the Old and the New Testament, and on Latin, the language of biblical text transmission in the West up until the Reformation and thereafter. After an introductory session, which will deal mainly with the relations between language and their writing systems and religious texts in general, each following session will deal with each of the Biblical languages, briefly describing them and the more relevant questions surrounding the textual linguistic composition. Jesus and His disciples were Jews from Palestine and in their daily lives they spoke Aramaic, a Semitic language related to Hebrew, and yet, the writers of the NT chose to render Christ’s words in Greek, a totally unrelated and structurally alien language to Aramaic or Hebrew. This session will look at Biblical Greek in the context of Koine Greek and the influences it suffered from Hebrew. An attempt will also be made in order to explain why Greek was chosen as the language of the New Testament. Roberto Ceolin PhD (Oxon.) was educated in Coimbra, Salamanca, Salzburg and Oxford. He wrote his doctoral thesis on the Greek verb and his present research focuses mostly on the Indo-European and Greek verbal systems. He has taught Latin and Greek, as well as courses on historical and synchronic linguistics, in Salamanca, Salzburg and Oxford. At present he teaches ancient languages at the Faculty of Religious Studies-USJ, Macau.